MissKait: who's kissing you tonight? soo, how is everyone's weekend going? i hope well because mine is! i just got back from my darling little cousins first birthday (talk about adorable...thats him in the photo above!) and ohh my ddeeear stagecoach is in 2 weeks....i'm dying of excitement and yes i do have one of my outfits already picked out, and well it's amazing eep i even found a pair of real cowboy boots at a thrift shop...and well...i caved, i mean i had to have them hah! but don't you guys worry because you'll definitely be seeing tons of photos later on! 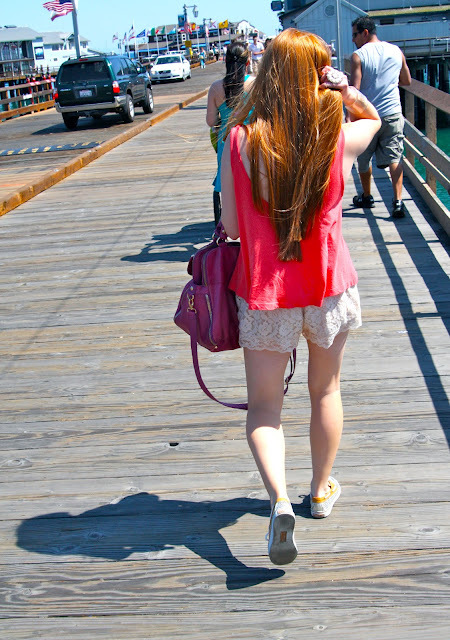 hehe, anyways these photos are from last weekend where my sweetest phillip took me to santa barbara for the day. it was the nicest thing in the world to get away for the day with him, but i can't complain because we always have fun when we are together (yay for love) oh and we had lunch at a fun burger joint on the wharf looking over the ocean it was so so pretty..! and i must admit, we had the most perfect weather for the most perfect adventure! pretty pics, love your shorts! you look so awesome! and those are very nice picture! your picture is very bright and aye catching! May i know what camera you use for taking picture? superb pics and great look! Aw, you look gorgeous Kaitlin! YOu pull off this outfit so effortlessly, for me it would be hard to even pull off the ring! The beach looks abosolutely gorgeous, especially the water. :) And your little cousin is so cute! Gorgeous photos and I love your bag! Aww, your cousin is way too adorable, I love how messy children are at that age! what lovely photos! and cute little cousin! jealous you can just drive up to the ocean for the day. what a great photo shoot.i would love to be walking along a pier! i love your shoes, and shorts in this post! so cute. your baby cousin is adorable! 2 years old are my favourite age. awesome outfit for the beach... i love every single piece of it. Cute look! I love your sneaks! Super cute outfit, I love the colors and your shoes are so cool! I love spending sunny days in SB! Next time you are in the area, let me know :) Love your colorful outfit, and those lace shorts are so pretty! You have a gorgeous hair color!! You look greatm and I love your hair!If you want we can follow also with bloglovin, fashiolista, google+, twitter and facebook? wow the water is so blue!! love all the colors!! oh my gosh love!! one of my fave posts right here!!! you have the perfect beach stroll look...and how cute are you and the bf!!!!!!! your tank is just so gorgeous against the blue color of the ocean!! aaah....got me so excited for summer! I love the lace shorts! cute outfit, love the shorts and that statement ring is gorgeous. So pretty! We love, love, love your bag!! awesome! that tory burch cuff is gorgeous!